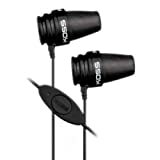 I’ve been a big fan of Koss Spark Plug earbuds for many years. They’re cheap, comfortable and sound great. I got my first set after some very expensive Sony noise cancelling earbuds failed on my (just after the warranty ran out), and it was obvious straight away that a good snug fit was an excellent substitute for active noise cancelling. As I find myself using Skype and Google Voice from my laptop (and my new phone) a lot for calls these days I’ve found that the built in microphone picks up too much noise, so I got the iSpark as an alternative. It’s basically the same headphones I’ve come to love with the Spark Plugs, but with the addition of a microphone and push switch. The microphone seems to work very well for calls, and the push switch is handy for pausing shows I’m watching on my iPad. Although they’re marketed to go with the iPhone these things seem to work with anything that has a 3.5mm jack for combined headphones and microphone. They also come with a handy little carry pouch, so I’m more likely now to just pop them in my pocket rather than having them sat in the bottom of my bag. I’ve been on the hunt for earphones that are comfy and have good sound for ages. I’ve been disappointed with Beat’s earbud’s at over £100.. I’ve just ordered a paid of the iSpark on amazon for £17.. They arrive tomorrow! One trick I use to make the fit nice and firm is to turn the conical ear pieces around.